He’s been in prison for more than two decades for a crime he didn’t commit. Why won’t North Carolina set him free? 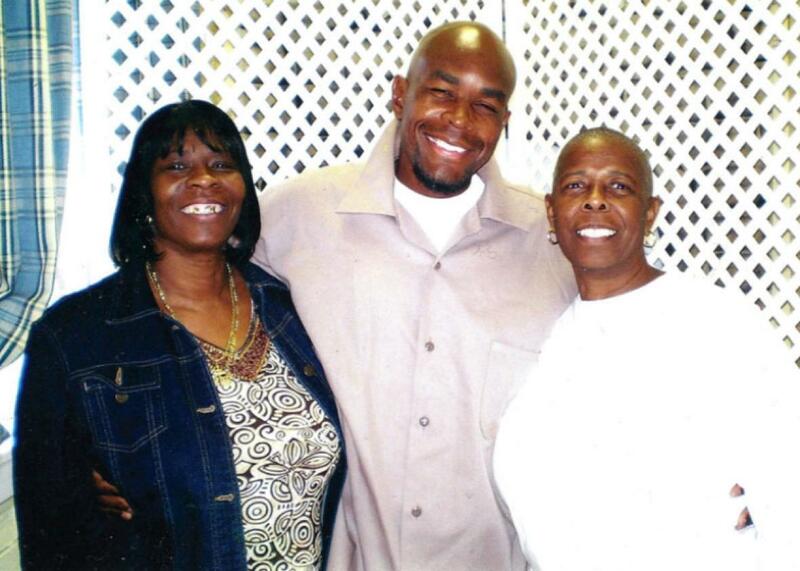 Dontae Sharpe’s mother Sarah Blakely, Sharpe, and his aunt Sharon Sharpe. In February 1994, in Greenville, North Carolina, someone fired a fatal bullet at a 33-year-old man named George Radcliffe. Police recovered Radcliffe’s truck, which had crashed into a chain-link fence, near the site of the shooting. They found Radcliffe inside the truck, slumped over in the front seat. The murder went unsolved for two months, until a troubled teenager claimed a black man named Dontae Sharpe had committed the murder because Radcliffe, who was white, owed him money in a drug deal. Sharpe, who was 18 when Radcliffe was killed, insisted on his innocence then and continues to insist on it today. Considerable evidence—including recantations by the state’s witnesses, signs of witness manipulation by the Greenville Police Department, and information pointing to another likely culprit—suggests he is telling the truth. Thirteen years old and suffering from serious drug addiction at the time of the shooting, Johnson claimed she’d noticed Sharpe and Radcliffe arguing after the latter shorted the former by $2 in a drug deal. Police, however, found a lot more than that amount—$53 to be exact—in Radcliffe’s wallet. She also claimed Sharpe fired one bullet while face-to-face with Radcliffe. An autopsy, though, showed a wound that traveled from the victim’s left arm through his chest and into his right arm. With the help of a friend standing nearby, the witness claimed, Sharpe placed Radcliffe—who was 5-foot-10 and weighed 225 pounds—into the victim’s compact truck. She said that one of the men “probably” sat on top of Radcliffe, then drove the car until it crashed. Johnson told the jury that Sharpe got out of the car, threw down the keys and the gun, and fled. But police did not recover a gun and found Radcliffe’s keys in the ignition. Beatrice Stokes, the government’s other eyewitness, claimed she saw a “scuffle” and then the spark of a gun going off. She believed Sharpe had a gun but stopped short of saying he’d fired a shot, and she never identified him as the shooter. A daily drug user, she acknowledged she could have been “high as a kite” on crack at the time of the shooting. Stokes never provided a written statement, and in a highly irregular move, police officers did not memorialize a single interview they’d had with her. That was the extent of the government’s case implicating Sharpe. No forensic evidence linked him to the murder. Police recovered two fingerprints from Radcliffe’s car, but neither matched Sharpe’s own prints. Nonetheless, in 1995, a jury convicted Sharpe of first-degree murder, and he was sentenced to life in prison. Not long after, the government’s case began to unravel. Stokes recanted in May 2000, confessing she’d held “the truth inside for years.” She said this while speaking to Sharpe’s paid private investigator, a former Greenville police detective who investigated Sharpe’s case and believes he is innocent. In December 2000, Stokes reversed course when reinterviewed by the Greenville police. This time, she claimed her initial trial testimony was true, although she maintains she never saw who fired the fatal shot. Stokes, too, had a motivation to tell the police what they wanted to hear. Unbeknownst to defense counsel, Stokes was in jail when she first identified Sharpe as the shooter and therefore was in need of police and prosecutorial assistance. It would have been easy for Stokes to point to Sharpe, who was already under arrest for the murder. And although she claimed otherwise at trial, she told Sharpe’s private investigator she was promised $200, which she received after testifying. There is also evidence the jury never heard that points to a different culprit. At trial, defense counsel proffered Tracy Highsmith’s testimony explaining that her boyfriend, Damien Smith, had confessed to shooting Radcliffe. Highsmith said he’d told her that he “would kill himself before he [would] go to jail for killing a white man.” Later that month, Smith shot himself in the head. The prosecutor objected to the admission of this powerful testimony, arguing that Smith’s words were hearsay—an out-of-court statement not admissible in court unless it falls within a well-established exception. Sharpe’s attorney—who in 1987, temporarily lost his law license after a conviction for drug distribution—failed to argue that this was a statement against penal interest, one that, if believed, might subject the speaker to criminal liability. Someone saying, essentially, “I am the shooter” certainly falls within that exception. The lawyer’s glaring misstep meant the jury never heard that someone else had confessed to the murder. If the events following this trial have not undermined public trust in Sharpe’s conviction, it is hard to imagine what will. The recantations, the excluded evidence, and the false statements lead to one conclusion: Dontae Sharpe should not have been convicted of this crime. There are now petitions pending before three people: North Carolina Gov. Roy Cooper, North Carolina Attorney General Josh Stein, and Greenville District Attorney Kimberly Robb. If Stein and Robb joined in a motion for appropriate release, Sharpe would be let out of prison immediately. Cooper could also grant a pardon of full innocence. Sharpe is otherwise out of appeals. If these three state officials decline to act, he will continue to sit behind bars, hoping to be granted parole—a scenario made less likely by the fact that he insists he is innocent.